even the most discriminating tastes. Please visit Where to purchase to find a store near you. The delicate veins of a solitary Cicada Wing make an unusual and stunning earring. One of our most popular designs. Petals radiate from the central cross in this floral inspired design. 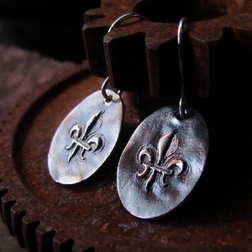 The graceful Fleur de Lis rests on a simple oval background. 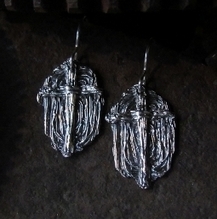 In the spirit of basketry, these unique earrings are woven from thin strips of silver and dangle from a curved bale. The rhythmic shape of the Solid Cicada Wings, reminiscent of Louisiana summer nights, makes an exquisite statement. Beauty can be found in the simplest forms of nature. 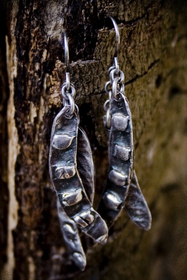 These wild flower bean pods form a whimsical pair of everyday earrings. The intricate lines of the textured cross pick up the deep hues of the antique patina.